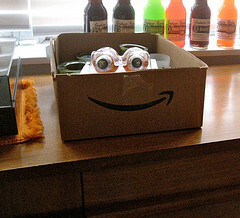 Okay, so there are probably more than a few people out there with the last name of “Amazon,” but when you tell someone at a major prepaid wireless provider that you bought your phone “on Amazon,” they should understand that you are referencing the mammoth online retailer and not a particular human being. Alas, Consumerist reader John says that’s exactly what happened to his wife Patti when she tried to contact Boost Mobile about a problem she was having with her brand new $300 phone. The Samsung Galaxy S II was purchased last week as part of an Amazon “Lightning Deal,” and was sold directly by Amazon and not one of its third-party marketplace vendors. But when Patti went to activate it… no dice. The phone was coming up as already registered by another user. Patti: I just purchased a new Galaxy S II from Amazon and it is saying that it is already registered on your network. Boost: The phone is used. You need to talk to the person you bought it from and tell them to transfer the phone to your account. Patti: The phone is not used. I purchased it from a Amazon.com. The box was sealed. Boost: The person you bought it from needs to call us. Patti: I didn’t buy it from a person. I bought it from Amazon.com. And around and around the customer service wheel went. At each level, no one at Boost would believe that Patti had purchased a new phone, still sealed in the factory packaging. Patti: So you want Amazon to call you to transfer the phone to you? Who would I get at Amazon? Jeff Bezos? Bob Amazon? Boost: Yes. Bob Amazon needs to call us. That’s what finally drove Patti to hang up in frustration. Still determined that the issue could be resolved, John tried contacting Boost. “The first person I spoke with patiently explained to me that I needed to have Mr. Amazon call Boost to release my used phone to my wife’s account,” he tells Consumerist. The rep continued to insist that the phone had been used/refurbished/purchased from a third party. But wait — one call to Amazon and — voila! — a new phone is being shipped out overnight, along with a return mailing label to send the “used” phone back. UPDATE: After the story was first posted, we were able to put John and Patti in touch with a rep for Boost Mobile, who offered them a free month of service for their troubles.